Title: "The Spirit of Cumberland"
Description: Class leader 700 leads Q425 westbound at CP 109. Description: 700 leads Q293 westbound with a number of trash cars on the headend. Seen at the Sewage Crossing. Description: CSX 700 leads westbound train Q427 through Palmer with CSX 700 in the lead. Description: Class leader 700 eastbound with Q436 (SEFR) at CP 109. Description: opening day of the "new second track middlesex and somerset county nj"
Description: The first train to operate on the new Track One, Q300 creeping along at 10 mph. Title: A friendly wave from the Conductor! Description: After meeting U338 at Green Mountain, this loaded train rolls through Toecane, and will meet another empty at Kona. Description: CSXT Northbound Freight Train Q650 passing through 13th Street Interlocking in Birmingham, Al. as a rare snow storm dumps 4 inches in Birmingham, Al. 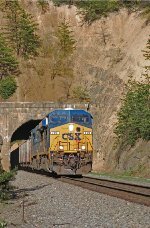 Description: The last shot of the weekend was WB CSX E500 an mty coal train exiting the west portal of Kellys Tunnel head to Hinton to be dispatched to one of the many coal branches that the CSX and ex-C&O has to offer. A side note to this shot is that we were able to shoot in two days the CSXT 600, 700 and 800 all on the head end of trains. 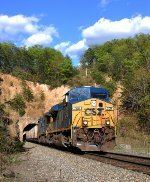 Description: Here is one final view of the last train that we shot, WB CSX E500 an mty CSX coal train exiting Kellys Tunnel head for Hinton and another load of West Virginia black diamonds. Title: 13:27 K781 Junction City to ? Description: Brandies Ave., 1621 hours.